We have seen in the previous part how the identity of pata~njali, about which Hindus have never had doubts, is maliciously obliterated by the western commentators of yoga. sthira sukhamAsanam (2.46), prayatnashaithilyAnantyasamApattibhyAm (2.47), and tato dvandvAnabhighAt (2.48). The view of Dr. Elst, that “pata~njali merely defines Asana as ‘seat’, ‘comfortable but stable’”, seems very simplistic reduction of the first sUtra sthirasukhamAsanam. Had Asana just meant so little as to merely mean a “comfortable but stable seat”, was it really worth enumerating as one of the limbs of the aShTA~Nga yoga? Would it not be pretty obvious to a rAjayoga student to anyway naturally take a “comfortable but stable seat” for practicing yoga? Why formulize upon Asana at all? Indeed, the word “Asana” in simple saMskR^ita, in itself means to sit comfortably, according to its vyutpatti: “Asyate Asate anena iti Asanam” (deriving from the same dhAtu from which English ‘sit’ and ‘seat’ also came). That a sUtra-kAra of pata~njali’s fame, who scrupulously economizes on even half of the short vowels (as he says in the mahAbhAShya), should spend not one but three precious sUtra-s to Asana, when all he meant by it merely was a “comfortable but stable seat”, is hard to fathom. pata~njali must have a deeper meaning when he says sthirasukhamAsanam. What does he signify by the specific indication of ‘sthira-sukha’ in the sUtra, when ‘Asana’ itself would be sufficient had his intention been such a basic meaning as suggested? The traditional Hindu wisdom says that deciphering the sUtras without help of an authoritative commentary, and better still under the guidance of a siddha preceptor, is fraught with the danger of gross errors for laymen. We refer therefore to the authorities of how they decipher what pata~njali implies in this first sUtra? vyAsa explains the meaning of pata~njali here by considering the joint of “sthirasukha” and “Asana” to be the karmadhAraya samAsa, making the sUtra mean, “That Asana is here called Asana which yields sthira-sukha i.e. unwavering delight”. vAchaspati mishra in the eighth century explains this sUtra in his tattva vaiShAradi as, “sthiram nishchalam yatsukham sukhAvaham tadAsana”: Asana is that which yields a comfort that is lasting, stable, and unwavering. (Although vAchaspati also treats the samAsa between sthira and sukha as bahubrIhi: “sthiram sukham yena tat”). So, all these eminent authors on yoga understand pata~njali’s instruction to not mean just any “comfortable but stable seat”, which by definition ‘Asana’ anyway is, but specifically an Asana that gives the sthira sukha to the yogAbhyAsI helping him reach a concentrated mind; such an Asana alone is called yogAsana. Like ‘chitta’, pata~njali is not defining ‘Asana’, as he considers Asana to have been already understood earlier, he is only adding these further qualifications to it. But is Wendy Doniger right when she says that the old texts including YS “say nothing about the physical “positions” or “postures” that distinguish contemporary yoga”, a view which Dr. Elst and Deepak Chopra seem to share? What about Chopra’s opinion when he says that the “the familiar poses are generally traced to Shiva cults”? Let us explore this next. Contrary to the above assertions, we find that ancient authorities mention the yogAsana-s, referring to them by name. Even the fairly antiquated commentaries of the pata~njali’s yoga sUtra itself, preceding the haThayoga dIpikA and gheraNya saMhita etc. by several centuries, already explain that Master pata~njali particularly implied these same standard “postures” when he instructed upon Asana in the yoga-sUtra. Consider the oldest available commentary on yoga sUtra by vyAsa. The author ends his explanation of pata~njali’s ‘sthira-sukham-Asanam’ with a list of the names of Asana-s, “…tadyathA padmAsanam bhadrAsanam vIrAsanam daNDAsanaM sopAshrayaM parya~Nkam krau~nchaniShadanam, hastiniShadanam, uShTRa niShadanam, samasaMsthAnaM sthirasukham yathAsukham cha ityevamAdIni”, that is, “Asana like the padmAsana or the bhadrAsana, vIrAsana, daNDAsana, or (squatting ) postures like parya~Nka or sopAshraya, or postures named after krau~ncha bird, or the Camel posture or the Elephant posture, or samAsana, or any other comfortable (instructed) posture which provide sthira sukha”. This elaborate list, though not exhaustive as the author says these are examples, is from at least as old as the 6th century if not older. Explaining the same sUtra of ‘sthirasukhamAsanam’, AchArya shaMkara also concludes his explanation of pata~njali’s instruction with, “…tadyathA shAstrAntara prasiddhAni nAmAni padmAsanAdIni pradarshyante”, meaning “…that is, for example, those well known postures explained in the other shAstras, like the padmAsana etcetera.”] He even desribes, out of these, padmAsana, bhadrAsana and daNDAsana in instructive details. An astute reader cannot fail to notice the casualness shown here in mentioning the representative names of the postures, when both the above authors refer to a few names of the Asana-s, followed by ‘Adi’, etcetera, meaning that the reader is anyway easily familiar with them. Also observe the words AchArya shaMkara uses above, “prasiddhAni nAmAni”, explicitly signifying that many Asanas were already famous by specific names and were not worth repeating there. Besides the above, further note the important word he uses, ‘shAstrAntara’. It is significant that shaMkara not only refers to these postures as famous, but also says those are ‘shAstrAntara’, or explained elsewhere beyond the yogasUtra or by the “other shAstra-s”. Of course we have no means at present to say which other shAstra he was referring here, but probably some older material no more extant. This is a very important testimony we get from the AchArya that even as far back as in his time, he understood the importance of the elaborate system of Asana postures to have gone back to the ancient upaniShada times, and their development being of a very obscure antiquity. Here rAjA bhoja also interprets pata~njali to have really meant the specific yoga postures, giving here the names of postures such as padma, daNDa, and svAstika Asana-s. And he also adds an “Adi”, etcetera, to mean that already there must be a long list of very famous and commonly known Asana-s which he felt no need to elaborate upon beyond ‘etcetera’. The above shows, we think, that in light of these ancient authorities, we can take it that pata~njali did imply specific postures that are understood as standard yoga Asana-s, and not just any comfortable seat. Not only do we find evidence in mahAbhArata therefore, of the importance given to the postures, specific postures, we should also observe that much before pata~njali, mahAbhArata already describes the yoga praxis in great detail. In the anushAsana parvan, it even describes the aShTA~Nga-s of yoga and even lists the famous teachers of sAMkhya and yoga, in which list pata~njali does not figure. This also means that the yoga text in the bhArata was pre-pata~njali and that by the time of pata~njali, yoga was quite a very well founded practice, its Asanas included. In the early classical saMskR^ita literature also, we find the Asana-s mentioned. The Emperor of saMskR^ita poetry, mahAkavi kAlidAsa, already names the yaugika postures. He mentions vIrAsana in his raghuvaMsham by name (13.52) and also beautifully describes the siddhAsana through a verse. Ancient drama mR^ichcHakaTikA, going back to the BCE age, also describes yoga posture (see the opening chapter). Dr. Elst has wondered why only sitting postures characterize or at least dominate the yogAsana-s, speculating that this is to do with the climatic conditions: that the Chinese postures being in standing position because it is wet and cold out there, whereas Hindu ones being in sitting position because of the warm climate here. But the observation is inaccurate. Indeed we have enough textual and non-textual records of Hindu Asana-s also in standing, half-standing and leaning postures too from fairly old periods. mahAbhArata itself attests to this at multiple places, too numerous to recount, that standing postures were common for tapashcharyA. 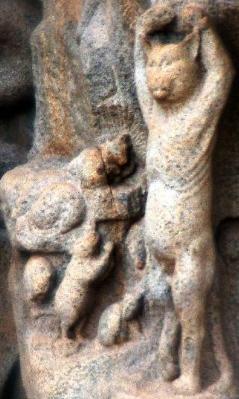 We find many ancient frescoes, murals, and bas-relief from old temples displaying the yoga postures in the standing position, see for instance the pallava temple carvings at mahAbalIpuram, dated to the 600s, depicting arjuna, bhagIratha and other characters (including a charlatan cat), to be performing the ascetics standing in the classical postures like the tADAsana and vR^ikShAsana. There are many other sources that attest to the postures in standing position, particularly for performing the tapascharyA, more specifically recorded by the early nAstika grantha-s, and both the bauddha and jaina texts record the standing postures. mahAvIra’s austerities in pristine tADAsana is all too famous. Also important to note is that the jaina-s carefully record that bhagavat mahAvIra acquired his siddhi while he was in a specific yoga posture known as the godohanAsana (see image), so called because it resembles how one milches the cow. godohanAsana remains a classical standard yoga posture. We further find traces of standard yoga postures in standing, half-standing, or leaning positions in other extra-yaugika special interest groups such as those in nATya and the practitioners of the Hindu martial arts, both of which are concerned with and utilize the standard yoga postures. The dhanurveda texts, variously titled and differently dated, tell us about specific Asana-s to be employed for specific purposes. The most complete, last redacted in the present form by around the 13th century but obviously containing much older material, the dhanurveda of vyAsa, tells the archers to assume one of the Eight Asana-s while shooting the arrow, each of which except the last, is in standing and half-standing posture. It describes each Asana and even mentions them by well known names such as the Asana-s of vishAkha, padma, and garuDa. Other and older Hindu martial art texts such as those contained within the purANa-s or bauddha pAlI sUtra-s inform us about the specific standing postures useful for practicing malla and other yuddha vidhA-s.
Coming to the climate part, yoga authors specifically mention that the Asana, by one of its very purposes, takes the body of the practitioner beyond the effects of climate and other such dualities. Explaining the last yoga sUtra on Asana, “dvandvAnabhighAt”, rAjan bhoja explicitly gives the example of climate, saying when the practitioner has perfected the yogAsana, the very effect of it is that Asana makes his body transcend and withstand the effects of extreme climate, both warm and cold. To summarize, what the foregoing discussion aimed to show is that Asana had already acquired a technical sense during mahAbhArata, and even before, from upaniShadic times. That pata~njali does not need to define Asana itself, but simply add more specific qualifiers to it, also shows that the concept of specific Asanas was already a common knowledge. Such names of Asanas as padmAsana, daNDAsana, bhadrAsana, svAstikAsana, and vIrAsana, vajrAsana etc. were so very common and well known among the Hindus already from very early days. By as early as the 6th century we find the yoga authors not only mentioning them by name, but in a sense that it was such a common knowledge that simply indicating a few names appended by ‘etcetera’ is sufficient to indicate them all. We also see that even these ancient Hindus were conscious about much further antiquity of the system of postures for yoga, as even AchArya shaMkara remarks about its obscurely ancient origins and wide popularity and recognition already by the time of the old layer of the upaniShada-s. We also noted that the Asana-s, the postures, is what he takes as being a general identifying characteristic trait of the yoga system. There are old records of not only sitting but standing, half-standing and leaning postures being practiced, and that the yoga authors were particular about Asana being for the very purpose to make the body of practitioner withstand the worldly dualities like the hot and cold climate. The hindU-dviTa vultures delegitimizing the Hindu legacy of yogAsana remind us of how the legacies of our glorious cousins the Hellenes of Greece were also robbed away, how the fanatic pretamata first undermined, then outlawed, and finally secularized as its own, the ancient spiritual gymnast-athletics and its kumbha-like deeply spiritual festival of Olympic that was celebrated to honour the dyauspitR^i. Lamentably the perished Hellenic civilization would be unable to reclaim the Olympic from what it has now been vulgarized and secularized into. But the Hindu civilization is still alive, so far at least, to call yogAsana its asset, happy to share with the world, but as its very own ancestral civilizational and spiritual legacy. Many legends of rAjan bhojadeva pramAra allude to widespread erudition of the common man of his reign; many tales portray carpenters, potters, ironsmiths, tailors, field-labourers and even thieves having stunning knowledge of saMskR^ita and poetic talent. (Now watch out) O rAjan, yamarAja seems bent on consuming away the “bha-” vya~njana sequence (by the svara order a-A-i-I-u-U- etc), and with bhukkuNDa, that is me, about to be executed, you, bhUpati bhojadeva, might be the next one on his list! Poetic audacity ensured clemency to the saMskR^ita-speaking convict. In another legend, bhoja was once riding his horse when he saw an elderly timber-seller carrying an apparently heavy burden on his shoulders, so he asked him, in “broken” saMskR^ita, whether the burden was not too heavy for the old man. To this, the man sadly replied with a hemstitch in immaculate saMskR^ita, “Not anymore O moon-like bhojadeva, now that I have an even heavier burden on my heart! That our beloved rAjan either himself speaks ashuddha bhAShA or likely thinks that we do.” After apologies from bhoja, the man was greatly rewarded. This interesting reference to rAma setu comes from one of those trifling and forgotten episodes, which although insignificant in detail, change the course of history. One dark night a contingent of armed men, under a crimson flag decorated with golden garuDa, the royal insignia of mAlava country, was swiftly riding on the wild banks of vetrAvatI (betavA) along with a prisoner and an execution-warrant. Despite being a mighty ruler of mAlava, with boundaries stretching between chambal in north to godAvarI in south, paramAra mu~njadeva was living with a sense of insecurity from a young prince, a nephew of his own and hardly a teenager. This prince, bhoja his name, was quickly gaining many admirers among paNDita-s and Generals alike. Despite being inflicted with a terrible brain tumor, he was proving himself to be a rare talent of both shastra and shAstra, hard to say which his better forte was. All the influentials of the kingdom were foreseeing the promise of the chakravartin-crown kissing his brows. Envy and alarm having taken possession of the king’s better judgment, he at last decided to liquidate this potential danger to his throne, and ordered his trusted guards for a secret execution, for which the prince was now stealthily being taken into the woods on the banks of betavA in thick of that night. Having scribbled these last lines of his life, bhoja was now ready to meet his death. But little did he know that destiny had other plans for him. Seeing an unnecessary and wasteful end to such a talented prince, a ray of mercy arose in the heart of the commanding officer. At his risk, and in his hope against hope, he decided to put off the execution by a day and leaving bhoja in custody of his men, he rushed to the capital and delivered the message to the King. The King, reading the lines, was so moved that all his envy was washed away now by guilt. When the commander informed him that prince was still safe, he was overjoyed and not only did he himself bring bhoja back, but also declared him the heir in preference over his own sons. And indeed it would seem destiny had other utility of bhoja when it inspired him to scribble that chhanda on the banks of betavA that night and saved his life. For, it was then that hundreds of miles away on the shores of the Oxus and Syr-Dariya, barbaric hordes of turuShka-s and Usbecs, having recently equipped themselves with the zeal of Islam, were gathering storm to pour down upon the Hindus, for the first time inside India-proper to the east of Indus. It was bhoja, who had now become the mighty ruler of mAlava when the savage marauders from west and now followers of Quran, marching under the banner of mahamuda of gazna, invaded gujarAta which was on bhoja’s south-western neighborhood and ruled by an enemy prince. When bhoja heard of the sack and desecration of somanAtha, even in the domain of his enemy, he immediately marched with his army and that of his neighbours to punish Mahmud. And chroniclers, both Hindu and Muslim, record that bhoja meted out such harsh retaliation on the returning army of turuShka-s and Usbecs, marching in pursuit of Mahmud all the way upto Indus, destroying entire Muslim enemy that was met on the way and crushing invaders so completely, that never again in his life Mahmud dared to set his eyes to the east of Indus. The complete annihilation befell the branch of forces of Quran that had wandered northwards beyond the banks of Ganga, and this ensured that India was safe from Islamic invasions for almost 150 years to come. No wonder bhaviShya purANa remembers bhoja as the slayer of muhammad, and alludes to prophet appearing to bhoja in dream and giving him his confessions of creating a corrupt dharma. And that chhanda which bhoja wrote that night mentioning rAma setu, was not to be his last after all. During the long fifty-five years of his reign, despite being always on the battlefield he did compose numerous works varying greatly in nature, spanning across the subjects of philosophy to politics, poetry to civil architecture, and much more. In the previous parts (1:hitopadesha, 2:pa~nchatantra and chANakya) we have seen how the ancient texts of nIti have treated the aphorism of vasudhaiva kuTumbakaM. In this concluding part, we shall survey the rest of the sources where this shloka has appeared and understand the contexts of its usage. Very few monarchs come close to finding a comparable place in the Hindu subconscious, which even after the elapse of a millennium, the memory of legendary bhojadeva paramAra of dhArAvatI commands. Unlike others confined to the pages of history, his legacy lives on in so many ways, in urban proverbs and rural songs, in crude jokes and scholarly legends, or in massively popular folklores inspired by siMhAsana-battIsI aka dvA-triMshata-puttalikA-siMhAsanam or vikrama-charita, which to this date are the favorite of rural storytellers. First composed probably during the reign of bhoja in the eleventh century CE, or more likely shortly afterwards, this collection of thirty-two tales eventually became so popular that these were transmitted very early, as early as 1305, to even far away Mongolia and thence to Russia and Germany, so that even today ‘Arji Buji’ (from rAjA bhoja) is a hero in Mongolian folklore, and at least one story of Grimms’ collection of German tales is based on this work too. The framework of the collection is such, that in its each tale bhoja tries to ascend a throne belonging to the legendary vikramAditya, supported by a base of thirty-two statuettes. In each attempt, one of the statuettes would recite to him a story about the greatness of vikramAditya and demand bhoja whether he was up to him in virtue. Hearing the tale bhoja would silently step back from the throne in humility, until the very end of the work when he would be proclaimed entitled to the throne by the very decree of Gods, a symbolic way of the author to claim for bhoja the same pedestal in glory as that of vikramAditya the chief hero of these tales. It is in this popular work that we find our next stop for the shloka of vasudhaiva kuTumbakam, and at last here it is seen definitely in a positive sense. There are six major recensions found of vikrama-charita: a most common southern recension, manuscripts of which are found mostly from Andhra; a metrical recension with entire text in anuShtubha meter; a prose-only brief recension; two individual jaina recensions in devanAgarI mostly from central and western India; and finally a recension of vararuchi. Then there is another popular collection of tales spawned by vikrama-charita: twenty-five vetAla fables known as vetAla pa~nchaviMshati or vetAla pachIsI, the germs of which are found in one of the 32-siMhAsana tales itself. Among all the six recensions, VK can be sited in three, coming in three separate stories. This tale which opens with VK is about vikramArka’s bravery in renunciation. He once decides to perform a grand ya~jna in ujjayinI, in connection of which he dispatches a brAhmaNa towards south to invite Sea-God. While Sea-God did not come, he returned the brAhmaNa with a gift of four rare magical gems for vikrama, each of which had a different magical quality. By the time this envoy returns back to ujjayinI, the yaj~na is completed and the king has donated everything he had to others. Having nothing left with him, he would ask this brAhmaNa to accept any one of those gems whichever he chose. An interesting debate would ensue between the brAhmaNa, his wife, son and daughter-in-law, about which one of the four gems should be kept. In the end they being undecided, vikrama would generously grant them all the four gems, even though he had no wealth left with himself and was in need. In the jaina recension, the shloka of VK appears in an intriguing tale known as paropakArAya-svadehAhuti-dAna, recited by suprabhA who is here the seventeenth statuette. This tale too is about the magnanimity of vikrama and his generous disposition. In this story, there is a certain ruler of an insignificant fiefdom who once overhears the praises of vikrama and inquires as to why vikrama was so great. He is told that it was because of his generosity in donations. In jealousy the ruler decides to perform his own enterprise of donations, but having not sufficient income he would think of generating wealth through tantra-prayoga. He contracts a group of sixty-four yoginI-s to perform a certain anuShThAna which every time conducted would produce for him a certain amount of gold. However each time he would have to give up his body in an arduous prayoga at the end of which the yoginI-s would resurrect him with a new body. This painful exercise was undertaken a few times while vikramAditya came to learn about it. So one day when the prayoga was on, at the right moment vikrama would appear at the scene and jump into flames. The yoginI-s would be greatly pleased and after resurrecting him, they would grant him a desired boon. The story climaxes with vikrama’s generosity, when he appeals to yoginI-s to grant wealth to the jealous ruler without having to repeatedly undergo that ordeal. In yet another jaina recension, and a quite late one written by paNDita shubhashIla gaNi in 1437 CE, the standard shloka of VK recurs in yet another story where it represents the justice of vikrama. In the other recensions the shloka is simply absent. Incidentally, bhojadeva also composed (or commissioned) a compendium of subhAShita-s attributed to kauTilya, titled chANakya-rAjanIti-shAstra, and VK is not found in the versions we have seen so far. VK appears this way in vikrama-charita, representing the generosity and justice of the king, and yet, not in any sense of universal brotherhood as is commonly misunderstood these days. Now, if the authors of various recensions of vikrama-charita decided to quote VK to highlight the magnanimity of their hero, it must have surely been a popular shloka by their time representing the sentiment of generosity. Indeed VK has appeared in all of these, explicitly in sense of being quoted from some reference. If so, where could that be from? We have to understand that by the time of their composition, the art of poetics in saMskR^ita literature had been transformed into a proper discipline of science. Precision in characterization of each emotion, appropriateness of expression, accuracy in usage of right meters for specific purposes, acceptable tolerance of liberty with grammar in poetry, how and when new words can be coined if at all – these had become commonplace knowledge among not only saMskR^ita literati but even broader elites. A few distinct, independent, and competing schools of thought on poetic discipline had already evolved and matured such as the vaidarbha, kAshmIraka and gauDIya schools. And as far as quoting from a common text is concerned, we should remember that by this time, the system of yellow-pages-like encyclopedic anthologies of subhAShita-s, the free floating, orally transmitted, public domain maxims, adages and aphorisms, had also become quite popular. Such anthologies, often called kosha-s or saMgraha-s were not only useful to common users to enhance their expression in speech, but also certainly referred by the dramatists and prose-writers such as those of vikrama-charita, to quote suitably according to the mood and situation of the context. vallabhadeva has listed VK as third in the sequence under ‘generosity’ (ironically, next to the section on niggardly misers). vallabhadeva hands us another very significant lead by assigning the authorship of this shloka to udbhaTa bhaTTa an eighth-century poet from kAshmIra, who was an important milestone in the progress of kAshmIraka brand of poetics, the development of which began with bhAmaha and completed in mammaTa. Now let us then examine where exactly and in which context udbhaTa might have uttered this verse. Of all that is available anymore from the pen of udbhaTa, and he is said to have composed at least three major works, we are unable to find the shloka of VK. We do know through his contemporaries that he composed bhAmaha-vivaraNa a commentary on bhAmaha, kumara-sambhava a kAvya, and kAvyAlaMkAra-sAra-saMgraha, a treatise on recommended expressions and embellishments in poetry. Of these the first two are lost and not extant anymore — the first one probably falling to disuse after mammaTa had delivered the last word on the subject, and kumara-sambhava probably drowned in competition to the mahAkAvya of same title by the emperor of saMskR^ita poetry. However, his kAvyAlaMkAra-sAra-saMgraha is still extant besides other snippets of his, quoted by writers such as indurAja the teacher of savant abhinavagupta in his laghuvR^itti, or indeed like the three verses of his preserved by vallabhadeva in subhAShitAvaliH from where we came to him. Therefore, it is entirely possible that udbhaTa might have used the shloka of VK is some works which are lost to us, although we have no means of knowing the context in which he would have used VK. But we do know that he would have been only quoting this shloka and not have been its original author as claimed by vallabhadeva, since more than a full millennium before udbhaTa, viShNUsharman had already quoted it in pa~nchatantra. Talking of poetry and talking of vikramAditya and bhoja, another name that naturally springs up in our minds is bhartR^ihari, the maverick elder brother of vikramAditya. bhartR^ihari’s three famous volumes of a hundred shloka-s each, nIti-shatakam, vairAgya-shatakam, and shR^iMgAra-shatakam, are very widespread and commonly found. Although the contents of shataka-s vary between various versions of theirs, the sholka of VK is not found in any of these that we have seen so far except for one edition compiled by Marxist historian D.D. Kosambi. [bhartR^ihari-viracita-shatakatrayAdi-subhAShita-saMgraha, D.D.Kosambi (1948.)]. However, considering the overwhelming evidence of VK being absent in a vast majority of various recensions of bhartR^ihari’s trayI, it seems more sensible to conclude that it must have been an interpolation in this single source where kosambi sighted it. Besides, as the earlier works already quote this shloka, that rules out its authorship to bhartR^ihari. So far we have seen hitopadesha and pa~nchatantra, compendiums of aphorisms of kauTilya and bhartR^ihari, Andhra and jaina recensions of vikrama-charita, encyclopedic anthology by vallabhadeva and through him the snippets of udbhaTa. Nowhere, not in the least, do the authors of any of these works ever claim to be the origin of vasudhaiva kuTumbakam. In every single instance, the verse has been explicitly quoted as a remark often appended with ‘as has been said’. But there is one and the only one exception to this where this shloka comes as a natural, inherent and intrinsic part of the base text, and that is why we had kept that source to be examined in the end. In the seventh adhikaraNa of the second chapter of shrI-bhAShyam, the prominent and most celebrated commentary on bramha-sUtra, AchArya rAmAnuja is critiquing the philosophies of kApAla, kAlamukha and pAshupata schools of shaiva mata-s in its thirty-sixth sUtra. There, he quotes in support of his arguments the first line of a rather less known and referred upaniShada – mahopaniShada (“eko ha vai nArAyaNa AsinnabramhA neshAnaH… sa ekAkI na ramate” MU1.1). Now this upaniShada, although not as much circulated or read as the others, is certainly not devoid of authenticity and importance. For, we also find many other classical vedAntins making references to mahopaniShada, including but not limited to yamunAchArya in puruSha-nirNaya, nArAyaNArya in tattva-nirNaya, and yAdavaprakAsha in his commentary on the bhagavadgItA, to mention but a few. The shloka of vasudhiava-kuTumbakam, a slightly different variant of it, is to be found in this mahopaniShada as the seventy-second shloka of its sixth chapter. Here instead of ‘ayaM nijaH paroveti’, the shloka reads as ‘ayaM bandhurayaM neti’ (‘this is a friend and that one not’), while the rest of the anuShTubha remains the same. Not a recommendation or prescription of any sort, not an ideal or a goal for soceity to acheive, having nothing to do with anything outside the realm of individual spirituality, and simply a statement on the very nature of the bramhavetta-s of highest attainment. We had set out on an excursion into the forest of saMskR^ita literature, to figure out where does the famed verse of vasudhaiva kuTumbakam come from, what was the sense and context in which the ancient AchArya-s had uttered it, and whether they ever meant this shloka to mean a recommendation for unconditional universal brotherhood or a principle of state. We also wanted to figure out the origin as well as transmission of the shloka through the periods of Hindu history. 1. mahopaniShada (6.72) uses the shloka to describe one of the lakShaNa-s of brAmhI-sthiti of highest level of spiritual progress. As we noted earlier, mahopaniShada is the only text where the shloka of vasudhaiva kuTumbakam is the natural and intrinsic part of the rest of the text, whereas in others the shloka has been quoted as an explicit quotation. We have therefore a very strong reason to comfortably believe that this upaniShada might be the original source of this shloka. Indeed, by the very nature, upaniShadakAra-s, tend to be original except for quoting the passages of or retelling the themes from veda-s or at times from other upaniShada-s, but never from any external literature, whereas the reverse can be seen very often. Besides, an upaniShada quoting an already popular shloaka and in a natural sense of its integral text is unimaginable. Indeed the upaniShada having VK and so many early texts as the pa~nchatantra quoting it, itself would support an early date for this part of the mahopaniShada if not whole. Besides, so many of vedAntin commentators especially of vaiShNava bent, quoting it in their works supports its popularity: in shrI-bhAShyam (2.7.36) by rAmAnujAcharya (~1080 CE), in puruSha-nirNaya by yamunAchArya, in tattva-nirNaya by nArAyaNArya, in a commentary on the bhagavadgItA by yAdava prakAsha, and a complete commentary on mahopaniShada by sha~nkarAnanda (~1300 CE). It does seem likely that the pre-mantramArga pA~ncharAtra vaiShNava-s had a mahopaniShada that was the core of the text that today survives under that name, and VK might be present in that ur-text of mahopaniShada. This would also mean that a such a mahopaniShada was in place before it became widely popular and viShNusharman quoted it. 2. pa~nchatantra (5.3.37) has it come from a declared fool who is killed by his naivety, suggesting it as a symbol of impracticality. This text was certainly written towards the end of the mauryan empire. In political sphere, smaller janapada-s were witnessing a revival along side foreign invasions. In social sphere, jaina, bauddha and vaiShNava mata-s were witnessing popularity. It must have been under such politico-social conditions, and in response to the pacifist tendencies, that viShNusharman must have warned against the tendency represented by vasudhaiva kuTumbakam, by making it an utterance of a fool who dies from his naivety itself. 3. hitopadesha (1.3.71) goes a step further along the same lines as pa~nchatantra, and clearly demonstrated through two satires, its usage by subversionists as well as tendency of gullible to fall for it. It also praises the realist heroes that are not influenced by VK-speech. Immediately preceding to its composition, one should also notice the southern version of pa~nchatantra-s mentioning a similar message in their tales, an iconographic representation of which was even sculpted on the bas-relief of the mahAbalIpuram temple by the pallava-s, an image of which is presented in the end of this article. 4. kauTilyan compendiums don’t have VK, except for two minor recensions, and kauTilyan thought is incompatible with what is generally understood as the sentiment of VK. 5. 8th century udbhaTa bhaTTa might have quoted it in some poetical work that is no more extant, and therefore we don’t know its context. 6. subhAShitAvaliH (udArAH.498.) lists this as a subhAShita for its poetic value in representing kindness. Also important to note is that by this time, people had already forgotten the source of the shloka, as vallabhadeva mistakenly attributes its origin to eighth century kashMiraka poet udbhaTa, not knowing that it was present even in such popular texts as the pa~nchatantra. 7. The three recensions of vikrama-charita (Andhra 3.1, Jaina 17.3, Jaina-shubhashIla 6.270) quote VK to stand for generosity and justice, but still not any universal brotherhood. Now we can safely conclude by saying that this shloka, snatched away from the original contexts as mahopaniShada presented it in, and disregarding how hitopadesha and pa~nchatantra and vikramacharita have used it, when it is sited by politicians and policy-makers as an ancient authority of liberalism and internationalism, the shloka is no more than a hoax. When our scholars site this shloka as an evidence of some sort of an ancient Hindu vision of utopic universal brotherhood, the shloka is again no more than a hoax. And when we hear our religious preachers sermonise using the shloka for people to follow the ‘principles’ of vasudhaiva kuTumbakam, the shloka is no more than a hoax in that context too.